WAC Lighting Responsible Lighting® Collection J/J2-Track luminaire employs 8-Watt GU10 miniature socket LED lamp with an average lifespan of 25000 hours delivers a brightness of 470 Lumens. LED lamp has color rendering index of 85 and color temperature of 3000K. Lamp has voltage rating of 12-Volts. 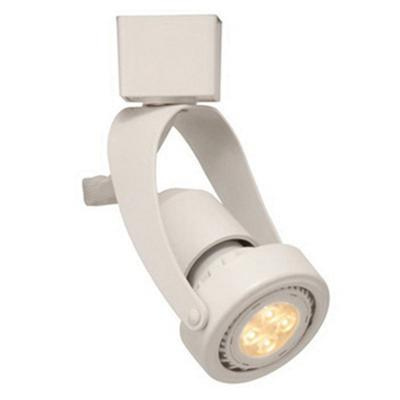 This 5-1/8-Inch extension track luminaire in white finish, features formed metal with polycarbonate construction. Head of this dimmable track luminaire measures 2-5/8-Inch Dia x 2-3/4-Inch. This line voltage track luminaire supports 350-degree horizontal rotation and 90-degree vertical aiming. It has swivel yoke design for precise aiming. Track luminaire is UL and cUL listed.